Multitasking on iOS has slowly evolved with successive annual updates since its inception in iOS 4, but iOS 9 brings more than a generational change to the feature's user interface. Instead of an app icon carousel -- which later became app panes -- that scrolls from right to left, iOS 9 employs a stacked card interface and switches initial scroll direction to jibe with the mechanics of 3D Touch. To switch back to a recently used app, perform an off-screen swipe while firmly pressing down and continue to move your finger across the screen. 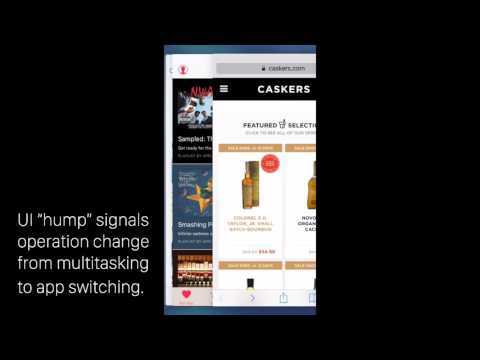 The app switch action will be triggered after your finger passes a "hump" in the UI -- visually represented by a noticeable undulation in the app card carousel -- at about four fifths of the way across the screen. Passing the hump and releasing your finger will open the second app. Wow, super cool. Thank for the tip, AI! Shame it doesn't work in landscape mode. All apps and functions should work in landscape, including AI app. While interesting and always nice to have multiple ways to do different things, I find it much faster and easier just to double-click the Home button. Achieves the same result. But other than that, it's a nice feature. What a horrible video! Trying to demonstrate touch motions without even showing touch, a finger in motion? Really? If your going to demonstrate something AI, use some common sense. Clarity of communication / precision is imperative if you are trying to educate. An actual demonstration of the physical action along with a voice over explanation is the proper way to do a demo, not some lame screen capture which doesn't show the physical gesture. I have a case that wraps around the edge so had a hard time trying to start off-screen wipe (trying to press hard on where case meets screen), but this actually works even if you start on-screen. Much faster than double-click and I also find it easier to do with one-hand operation. Good one. I'm thinking they're going this way because the Home button will be excised from a subsequent model of the iPhone/iPad, possibly the iPhone 7. Exactly. The only tech we haven't seen (but know Apple has worked on via patent filings) is a way to read your fingerprint directly from the screen. No more physical Home button and you can unlock by doing a firm press anywhere on the screen. You get Taptic feedback to let you know your "home button" press was recognized and your print gets read by the screen. You could even use the "double tap" that 3D Touch gives when you try a hard press somewhere it's not supported to get nod ate a failed print reading. Yup pretty much this. coming from a 5s to a 6s the size makes your hand sit such that the thumb operates most comfortably in the vertical centre half (with a quarter top and bottom) and mostly on the side. the home button is reachable but without a minor amount of strain and the motion is slower. then again yes, with a raised edge case - it is made more awkward. and I am surprised more and more that Apple doesn't get simple stuff like handedness - what if I mostly hold on my right hand - no swipe easy for me. Just got my 6S about 45 minutes ago and am still figuring all this stuff out. The last iPhone I had was a 5S, so a lot of this new to me. But it's still fun to play around with. Great, thanks to the podcast I just read that entire article in Mikey's voice. I will tell you, I really love this phone. I thought the size would be a problem, but it isn't at all. And wow, it's just beautiful. Now, once I figure out all the new features I'll be set. Heh. Oh, and if I can get used to the lock button being on the side. I still reach for the top every. single. time. I'm afraid I am still sticking with the double click on the home button. It's just a habit I got into and it's worked fine for me so far! Habits are hard to break. I'm realizing that now. But that multi-tasking feature is catching on with me for sure. It's pretty cool. You are aware of Reachability, right? Double tapping (not pushing) on the home button will shift the top screen elements down to the middle, making it much easier to reach objects from the upper part of the screen when using one hand. it is akin to if Apple when making the iPhone simply put OSX UI elements in and if they were too small you double tapped the home button to zoom in so you could press them. I concur. It's basically just admitting that you've fucked up the interface badly enough to have to build another layer of kludge just to make it operable. That's the Microsoft approach. I laughed at Samsung when they did something similar for their idiot slabs, and nearly keeled over when I saw Apple ape it. Hey. Here's a tip for A.I. Your tutorial presentations would 'actually' be better if you showed a human hand actually performing the actions. It may be that you feel showing the actual hand / screen interaction itself would 'clutter' the presentation, but honestly; it won't. It will make what's going on in the film much more comprehensible. Maybe give it a spin.